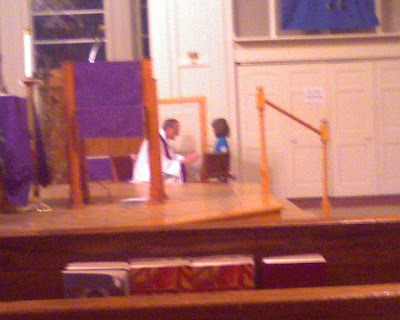 Frances had her First Reconciliation last night. I had a little chuckle because she woke up yesterday morning so excited about it! She had classes over the past month or so and learned about God's Laws (AKA 10 Commandments), the definition of sin and our need for forgiveness. She also had a chance to practice going to Confession and had a good giggle at some of the sins they got to pick out of the bag! Me: Henry, tonight is a special night for Frances. I want you to be on your best behavior. Henry: What is Sissy doing? 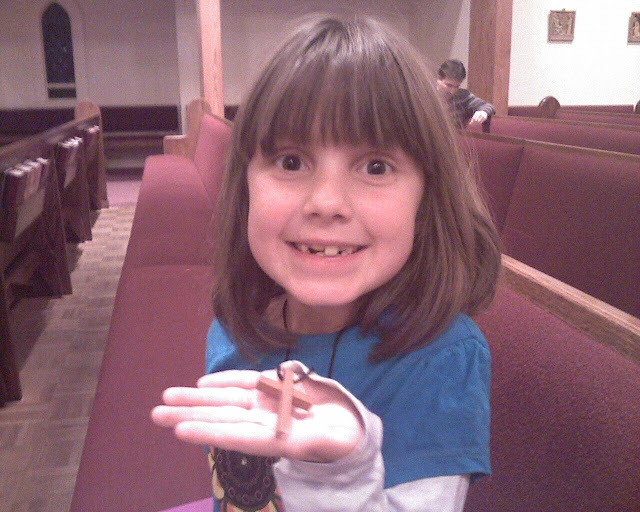 Me: Tonight is when she has her First Reconciliation. Henry: Is that when she talks to Fr. Tom? Me: Yes. She will talk to Father about her sins. Do you know what a sin is? Me: Sins are the things we do that make God sad. Do you do things that make God sad? Me: Really? Are you sure?? Me: Did you know that yelling at your Mommy makes God sad? Anyway, we picked her up and grabbed a quick dinner. (This time we were running late through no fault of my own. This time. Honest!) The service was a nice one and very kid-friendly. Other people were allowed to come, but Fr. Tom catered to the kids who were confessing for the first time. They had the prayers written out on the handout (which was probably great for some of the adults, too. Ahem) and three stations just for the kids to start out at so they could go first. They even had the screen and kneeler out for the kids that wanted to try it that way. Of course, Frances did. Afterwards there was a nice cross necklace for each child. The priests blessed the crosses right after the absolution and the kids got to wear them home (or play Cat's Cradle with them while waiting for their Mommies to go to Confession). She was so happy after she came back to sit with me. I wanted to get a chance to chat with her more about the experience, but her brothers were being...um...they were being little boys. I did get to overhear her talking to a friend about it and apparently she was "kinda nervous" but once she got started it was "pretty fun." So proud of you and the wonderful girl you are growing up to be, Frances!